Mention pentatonics in jazz and people will probably immediately think of Coltrane and McCoy Tyner. They might also think of trumpeter Woody Shaw, who developed pentatonic playing to an incredible level. Woody’s kaleidoscopic approach involved zipping across multiple tonalities on each chord by using collections of pentatonics. First things first though – for now, we’ll stay within the sound of the chord. It is often taught that over any given chord we could use this, that or the other pentatonic. True enough, but it’s better to say that we should use this, that and the other pentatonic. A really useful quick way to remember which scales go with a minor 7th chord is to note that the roots form a II-V-I-VI pattern (a turnaround) based on the root. The same scales also serve over EbD+4 – the relative major (Lydian and Dorian are in the same relative relationship as classical major and minor – Ionian and Aeolian). Learning the two chords as a pair is a very efficient way of practising, but be aware that each tone from the scales will have a different effect in the context of the relative major. Play through the exercises first with a Cm7 playalong, then with an EbD playalong, and keep your ears tuned to hear the different effects of the tones – in particular the A, which is the natural 6th in C (Dorian) minor and the #4th in Eb (Lydian) major. You can then take the exercise through the other keys, and use them as models to devise similar ways of linking pentatonics over other chord qualities. I seem to recall that Woody also once said something along the lines of: “If you can’t play melodically with pentatonic scales you don’t properly understand them.” With any luck this article will give you a good kick-start on that road. PS If you really can’t wait to get your outside stuff on, try doing the same exercise with C#m7 (and EΔ+4), then weaving between the two sets. These ideas are extracted from my book Pentatonic & Hexatonic Scales in Jazz. Nice article. Can you cite the source of these quotes that you gave supposedly by Woody? Can’t give you chapter and verse, I’m afraid, but I assure you I’m not making it up. From the dim recesses of my sun-addled brain I think I came across the quotes in either Paul Berliner’s Thinking in Jazz or Mark Levine’s Jazz Theory Book. Both essential reading, btw. With a position on the subject matter as strong as you’ve given, if you are going to cite the man himself to validate your theoretical position, it would be good to have some verifiable sources. Otherwise, how can one actually know for sure that this is what Shaw was thinking or how he was approaching his music? Unless you have actual proof that this is what he said, then the quotes and the interpretation of his approach become suspect. Basic musicological and academic principles. Thanks, again, for the article. Riiiiight. I’m well aware of the requirements for scholarship, but this is not my homework, mate! I’m perfectly confident that the quotes are right, and he certainly did use combinations of pentatonics. But at no point do I claim that Woody was thinking in terms of the specific scheme I’ve given here – that wasn’t my intention. This is just one way of getting into that kind of sound, and a way I’ve found easy to grasp and apply. Sorry if that wasn’t made clear, or you feel misled. Thanks for your thoughts and I’ve amended the article a bit to clear up any confusion. Thanks for this! what is meant by EbD? is the D for Dorian or D as the maj7 of Eb Lydian? 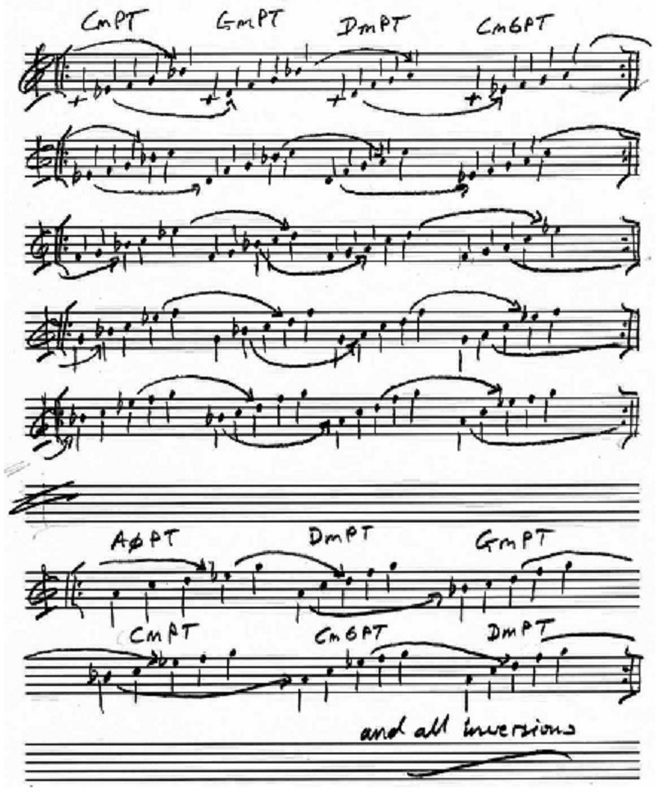 I originally wrote Eb[delta] – the triangle that is often used to represent a major 7 chord. Might have to watch use of the fancy characters in future if it’s not coming out right on people’s browsers. Thanks for letting me know this is an issue. Interesting possibilities – at the end of the day, whatever sounds good is good! However, I did have in mind here the idea of using the II-V-I-VI scheme as a quick and dirty mnemonic for remembering the roots of the suggested pentatonics that can be played over the home scale, rather than actual temporary turnarounds or modal substitutions. The idea behind this approach is being able to play freely and forever over Dorian or Lydian chords. You can then take this fluency and reimport it into major II-V-Is as you wish. Or adjust it as you wish. The example you give – Dm7b5 going to Eb – is actually the same thing as Bb13 going to Eb. I have something coming up on modes… Looking forward to the arguments! So we’re in the key of Bb playing on the II chord – C minor. Therefore the Pents are actually III, VI, II, VII. Of the Major Key , correct? Yup. But I had in mind a quick mental scheme involving the roots of a II-V-I-VI based on the chord you’re playing, rather than the key it comes from. So Cm7 – the roots for the pentatonics are D, G, C and A. The Dorian can be the II in a II-V-I, or it can be a substitute for the I in a minor II-V-I. The Lydian can be the IV chord, or it can be used as a substitute for the I in a major II-V-I (gives you something positive to do with the “avoid” note). I like the technique described here, but I don’t think this is unique to Woody Shaw, or a gives a deep insight into his harmonic concept. It’s heard in a lot of modal playing predating Woody. I can even think of a few examples of it heard on Jimi Hendrix’s “Band of Gypsies,” which is not a harmonically advanced recording (though it is magnificent in its own way). Fair point, Monsieur Honkeur. But as I’ve pointed out above, it wasn’t really my intention to imply that thinking the way I suggest can get you into Woody’s head. It was really more intended as a way to use the pentatonic sound more creatively than the dabbidy-dooby-diddle, and open things up. Perhaps hooking this post around Woody specifically wasn’t the best idea I’ve ever had!